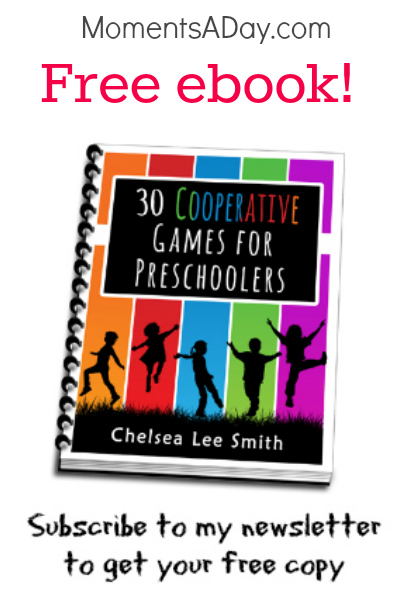 I am so excited that my first ebook 30 Cooperative Games for Preschoolers is now available! And it’s FREE! All of the games in the book require the children to play with each other without competition as a goal. They are simple, easy to follow, and fun! 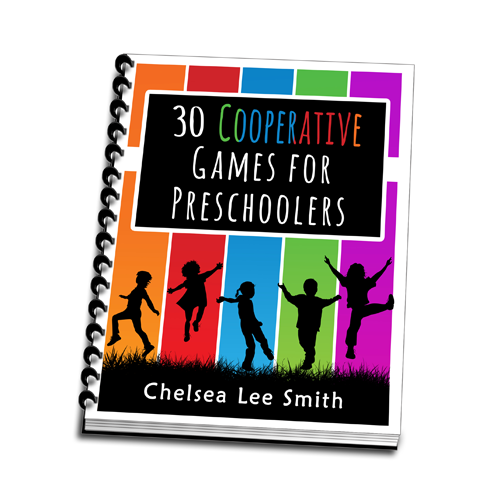 Great for classrooms, playgroups, or with siblings at home. These games offer opportunities to learn cooperation plus other skills such as following instructions, observation, and gross motor skills. Use them to break the ice in a new group of children, to transition to a different activity, at parties, and more. 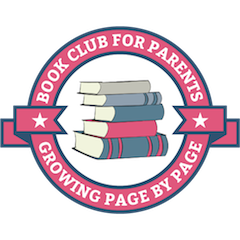 Hop over to this page and sign up to get your free copy. After confirming your subscription, you will be sent the link to download the book. I send out my newsletters once a month (occasionally twice, such as when I’m offering a new book!) reviewing the last month’s posts and sharing other inspiring articles and resources I have found. I hope you love these games as much as my family does! Enjoy! If you like these games, you will probably also love my set of 30 printable character building activity cards to use over a family meal. Find out about Mealtime Moments here. P.S. Those of you who have been following my blog for a while may remember this post explaining how I came up with these games, and you may have even downloaded the original document if you have already subscribed to my newsletter. That document has now been reformatted into a beautiful user-friendly ebook which I have emailed out again to all newsletter subscribers. How awesome! I rushed over to check my email – so exciting! I am feeling this book will help my program. But how can I can get that? Thank you so much for your eBook. I’m looking forward to reading it and playing the games with my boys. I am super excited to get this book and meal time cards.. Can not wait. Thank you so much.